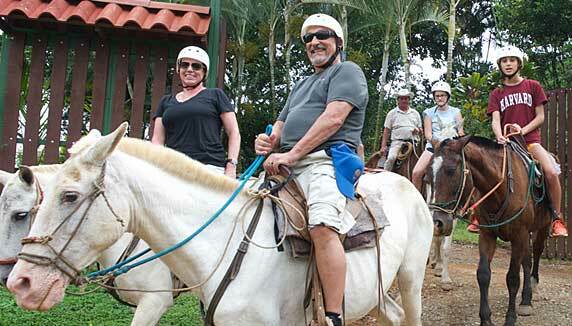 Experience real Costa Rican culture and hospitality in an idyllic mountain setting. Central Pacific, Manuel Antonio area. Santa Juana is open year round. 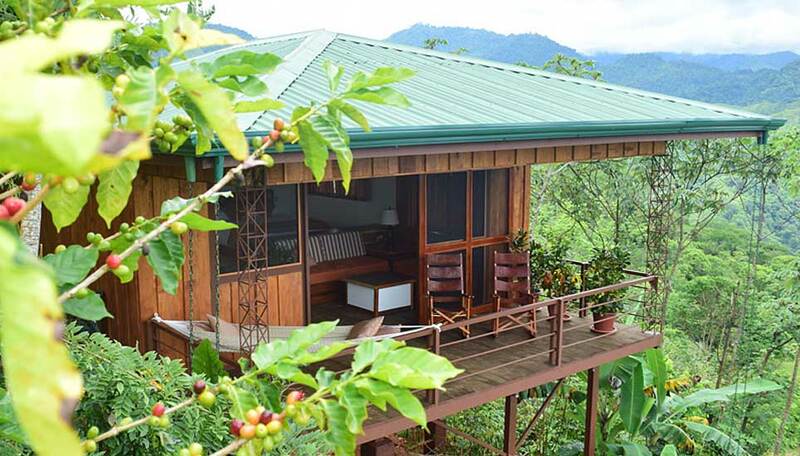 This is an exclusive eco-retreat, with beautifully appointed, freestanding cabins built on a hillside. All the cabins have panoramic views of the sprawling tropical forest that extends all the way to the Pacific Ocean on the horizon. 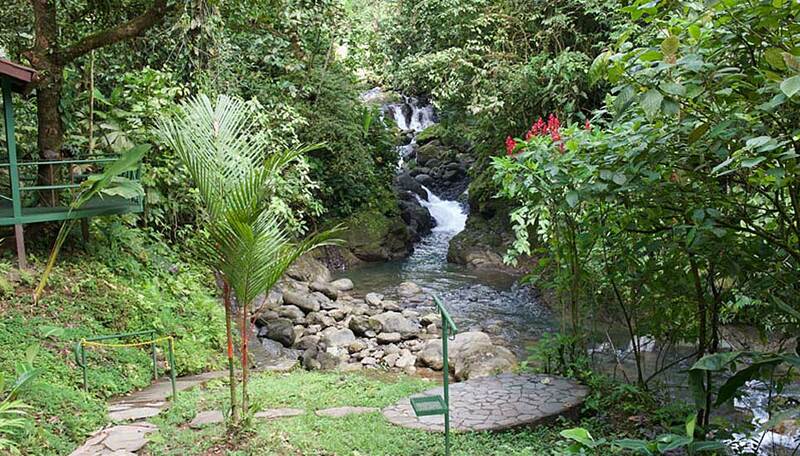 Santa Juana is all about immersing yourself in the local culture, landscape and nature and it’s about giving back. A high proportion of the cost of a room here goes back to supporting the local community and the surrounding environment. The lodge is also staffed by residents of the tiny pueblo of Santa Juana, providing employment in the area. You’ll delight in their hospitality, enjoy delicious local foods prepared in the traditional ways. 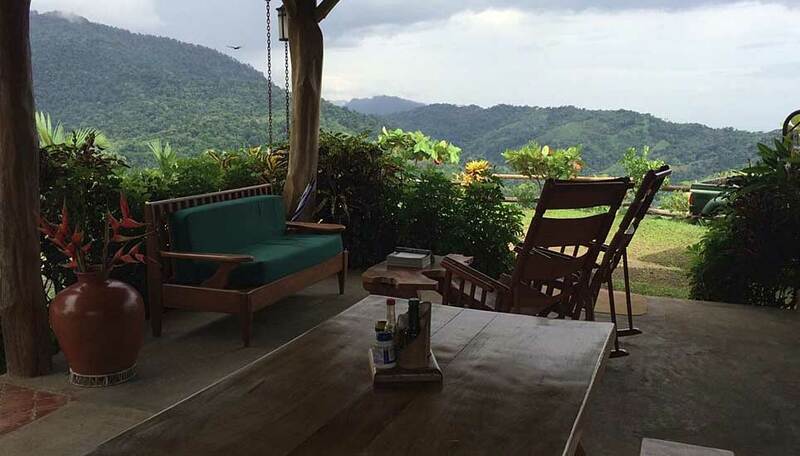 It is a genuine taste of Costa Rica in a place akin to paradise. Why go to Santa Juana? It’s not everywhere that you can immerse yourself in an experience that gives you a real taste of Costa Rican life along with nature, agriculture, adventure, education and authentic rural culture — this is the real deal. 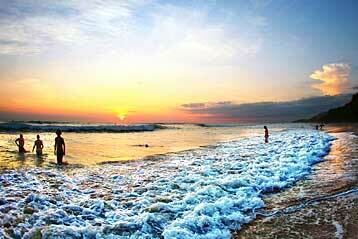 The ultimate goal at Santa Juana is to give the guests a a truly exceptional Costa Rica experience. Try your luck at organic tilapia fishing, visit an authentic sugar mill powered by two massive oxen, and have the option to take a guided horseride. Visit the rustic Santa Juana pueblo, where you’ll learn about coffee and citrus production, participate in the Carbon Offset Tree Planting Adoption Program and take the time to relax and enjoy the beautiful natural landscape. You’ll see fascinating regional wildlife here, including a myriad of birds, insects and reptiles. In the area surrounding the lodge you will find a rich blend of both local and migratory birds. About 80% of the birds are found year round and include red-capped manakin yellow-headed caracara, black mandible toucans and many others who add their voice to the sounds of the forest. It’s a great opportunity to sit on one of the many benches in the grounds, soak up the atmosphere and just listen. 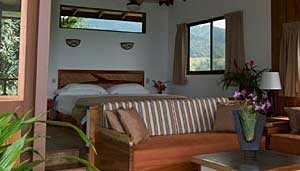 The rooms have king size beds, sofa couch, kitchenette, coffee machine, en-suite bathroom with shower, TV, ceiling fans. There are just 5 rooms at Santa Juana. 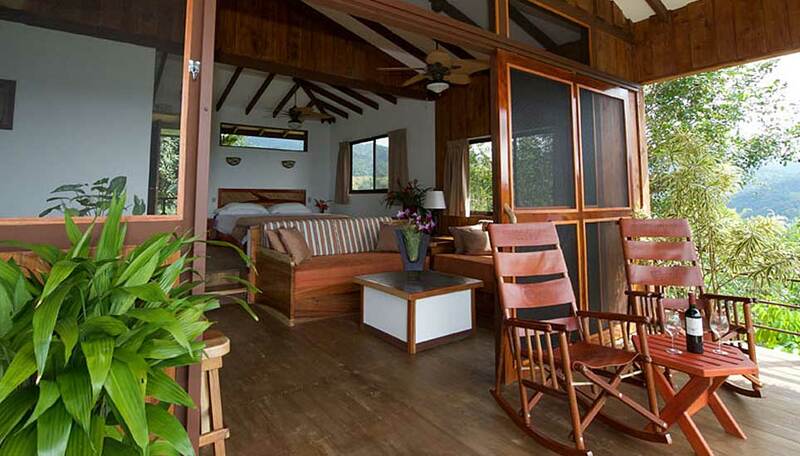 Casitas Each split-level Cabin is 65m² with high vaulted ceilings and panoramic terraces overlooking the National Park and coastline of Manuel Antonio. There is a king size bed and two couches, a kitchenette, and bathroom with spacious slate shower. Amenities include three ceiling fans, refrigerator, stove with range, microwave and coffee maker plus satellite TV. Village Casa ‘Chingolotea’ An authentic 100m² two-bedroom house with a panoramic terrace, two king size beds, couch, satellite TV, along with a kitchenette, bathroom with shower, and barbeque area. There are reduced rates for children at Santa Juana. There is a good cell phone signal.